The publication earlier this week by Awareness Times that Julius Maada Bio has claimed to have contributed the sum of $35,000, towards former president Tejan Kabba’s funeral costs, is at best mischievous and at worst preposterous. But it is most unfortunate that a Public Notice, alleged to have been written by the family and close friends of the late former President Kabba was exploited by Awareness Times as part of its failed smear campaign against Julius Maada Bio. This is because any reasonable person could have expected such a Public Notice to have been issued by Bio himself, if indeed he had made such a claim. Here was a man whom, upon the death of the late President. Kabba cancelled all of his scheduled meetings in London. And when he arrived in Freetown on Friday 21st March, he insisted on that very day – even before going home, to visit the residence of the late President. My understanding is that it was the SLPP Western Region Chairman – Manso Dumbuya, who explained the reason for Julius Maada Bio’s visit to the gathering at the Kabba family’s home. Therefore, had Bio made such financial contribution, he would have done so during that visit. More importantly, it should be remembered that Kabba’s legacy can never be valued against anyone’s financial contribution towards his funeral arrangement. The least we would have done as a nation was to have accorded him a befitting funeral. And today we can all be proud of ourselves that irrespective of our political views and status in society, we have together mourned, and were united in grief, as we laid the former president to rest last Sunday. Hence, for the family and close friends of the late President Kabba to allegedly issue such Public Notice, in reaction to claims made by “certain individuals” who do not represent the views of Julius Maada Bio, raises many questions about the motive behind the Public Notice. We do remember President Koroma’s Special Executive Assistant – Sylvia Blyden, inaccurately informing the world that the Prince of Saudi Arabia had donated US $2 million to the Government of Sierra Leone. The political fallout which ensued, led the Minister of Information – Alpha Kanu, to refer to Sylvia Blyden as “dangerous and demented rumour monger” and a “perennial liar”. And for any reasonable person to have suggested that such a factually inaccurate statement, published by Sylvia Blyden, represented the views of President Koroma, would have been a dishonest and unfair characterisation of the President. Because of this, the government information machinery, including the State House Communication’s Unit, read the Riot Act to Sylvia Blyden. And here we are talking about someone who has the rank of a cabinet minister and very close to the Presidency, putting out inaccurate information. Many people have now been left wondering how on earth a very respectable family like the Kabba family can authorise the publication of such Public Notice, knowing very well that the Julius Maada Bio has never made any such claims. 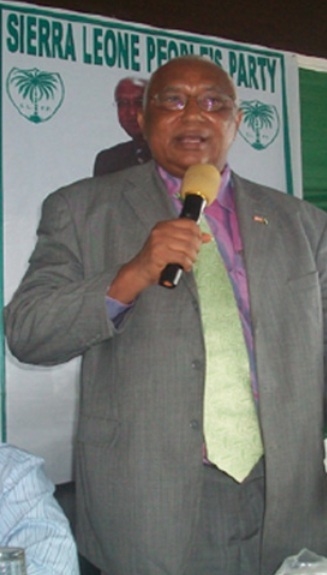 On the alleged incident in Kenema, reported in the Awareness Times, I have personal respect for Mr. John Benjamin, who was the former Chairman of the SLPP party. Unfortunately I may not have enough facts to comment on that alleged incident. John Benjamin is reported in the Awareness Times to be advising Maada Bio to disassociate himself from some of his associates. John Benjamin should also heed his own advice, by disassociating himself from many of the insults, vile attacks and crude smear campaign that his son – John Benjamin (Jr.) continues to make against Julius Maada Bio on the internet. Set aside the fact that the content of John Benjamin (Jr)’s crude insult against Julius Maada Bio has so many factual inaccuracies; but that John Benjamin (Jr) deliberately tried to smear both Julius Maada Bio and President Ernest Koroma, over a visit to Blaise Compaore, whom he refers to as “one of the financiers of our rebel war” is shameful. For the son of the former SLPP Chairman to insinuate that Julius Maada Bio worked with President Koroma to steal the election from Solomon Berewa, so he can launch his flagbearer bid, is a disgraceful fabrication. Furthermore, John Benjamin (Jr) wrote that Julius Maada Bio went to Guinea to visit Alpha Konate without Key SLPP party officials, when they fraudulently awarded the elections to President Koroma. As a matter of fact and to correct John Benjamin (Jr), Julius Maada Bio has at no point in time visited any “Alpha Konate” in Guinea. Rather, following the 2012 elections, Julius Maada Bio was invited on an official visit to Guinea by the Government of President Alpha Conde. And as part of his delegation to Guinea, Julius Maada Bio took along the then SLPP Women’s Leader, Mrs. Isata J. Kabbah and the SLPP Bo District Chairman – Alhaji Kanja I. Sesay. 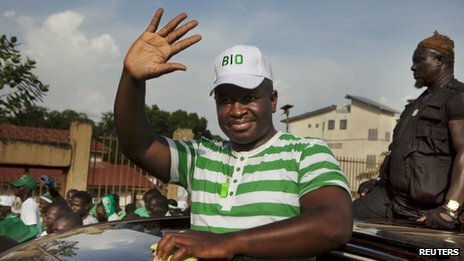 Whilst it may be politically convenient that, at every opportunity certain members of the SLPP party has always called for Julius Maada Bio to disassociate himself from the actions of his supporters, we must equally be honest with ourselves by asking senior members of the party to start disassociating themselves from the many insults, lies and APC-style smear campaign by their supporters against Julius Maada Bio. Well thought and said. My heartfelt congratulations to our newly elected president. May his leadership light glow and prevail upon the nation without barriers, in all aspects of human endeavors.